May and Might are modal verbs. They can normally be interchanged without a significant difference in meaning. With modals verbs, there is only one form of them for every subject pronoun. The same happens with MAY … I may, you may, he may, she may, it may, we may, they may. After MIGHT or MAY we have the verb, or more specifically, the base form of the infinitive. This means the infinitive without To. For example the infinitive is To Go so the base form is just the Go part. Instead of To Study, only study. Instead of To speak, we only put Speak after the modal verbs MIGHT and MAY. I might watch another episode. You may bring a partner to our event. She might tell us what happened if we ask her. We may be invited but I’m not sure. They might go to the beach this weekend. 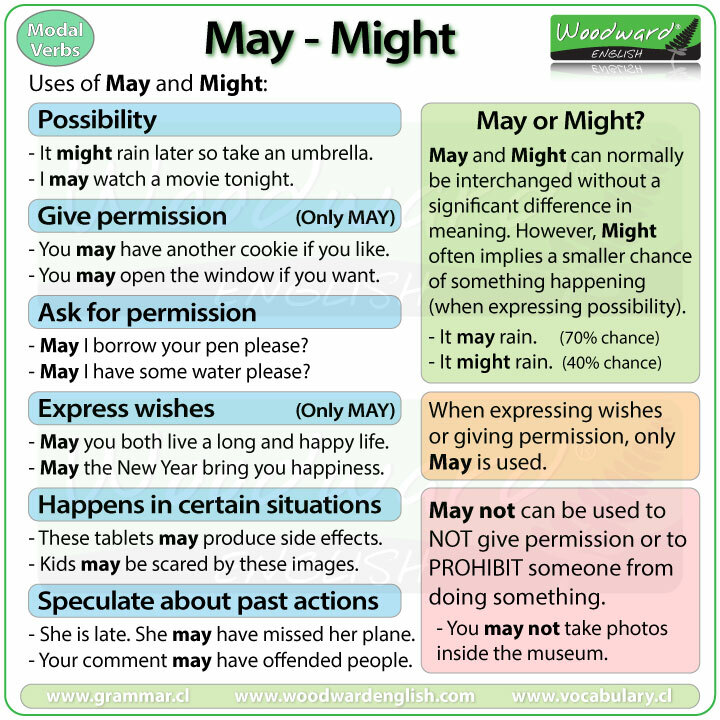 When do we use MAY and MIGHT in English? There is a chance of something being true or there is a possibility of something happening. Note: Might is used more frequently than May in spoken English. You can also say… it may rain later. I think she may win the singing competition …because her voice is amazing. They might be late because of the bus strike. Note: May sounds more polite than using Can or Could when asking for permission. May I have some water please? It is best to use PLEASE in the question to make it more polite? Note: In theory, Might can also be used to request permission but it sounds very formal and is rare. We do NOT use Might to give permission. You may open the window if you become hot. You may take a brochure if you like. You may leave the room once you have finished the test. We can use May not to NOT give permission or to PROHIBIT someone from doing something. You may not leave the room without permission. May is used in academic (or scientific) language to refer to things that typically happen in certain situations. Drivers may feel tired if they do not take a break every 2 hours. Adults may find it difficult to sleep if they use technology before going to bed. These tablets may produce serious side effects if not taken in the correct dosage. 6. MAY and Might are used to Speculate about past actions. Here we are saying that something was possible in the past but we are not sure. Your comment may have offended some people. She is not here. She might have gone to the market. What was that noise outside? I think it may have been a cat. With all of these examples, they were possible but we are not sure. When expressing wishes, only May is used. May you both live a long and happy life together. May the New Year bring you love and happiness.